Be a part of the world-famous TCS New York City Marathon excitement, run through the streets of Manhattan, and finish at the famed Marathon finish line in Central Park—without running 26.2 miles! 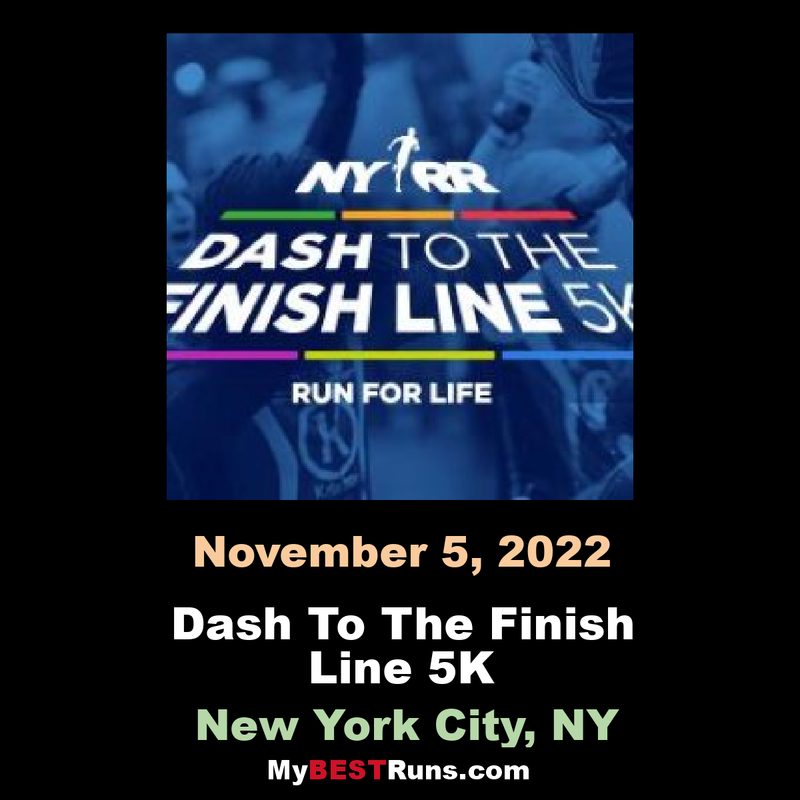 On TCS New York City Marathon Saturday, our NYRR Dash to the Finish Line 5K (3.1 miles) will take place for all runners who want to join in the marathon festivities. You can take a high-speed tour of midtown Manhattan—en route to a spectacular finish in Central Park. Friends and family, marathoners and non-marathoners—all are welcome. All entrants receive a technical T-shirt. Start corrals will be on First Avenue north of East 44th Street and west of First Avenue on East 47th Street. Mile 1: Start at Dag Hammarskjold Plaza on First Avenue at East 44th Street and head south. Turn right on East 42nd Street and head west. Turn right (north) onto Sixth Avenue just before the mile 1 marker. Mile 2: Proceed up Sixth Avenue toward Central Park and turn right on Central Park South/West 59th Street. Just before the mile 2 marker, turn left into Central Park at Grand Army Plaza. Mile 3: Proceed into the park, then turn left onto West Drive. Curve around the bottom of the park toward the TCS New York City Marathon finish line, on West Drive at 67th Street. With less than 24 hours to go before 50,000 runners set out to traverse New York City’s five boroughs, 10,000 got in on the TCS New York City Marathon action a day early at the Abbott Dash to the Finish Line 5K. Participants enjoyed a stunning course on traffic-free streets, starting at the United Nations, traveling past iconic Midtown landmarks like Grand Central Station and Radio City Music Hall, and wrapping up their 3.1 miles with a climb to the famed TCS New York City Marathon finish line in Central Park. 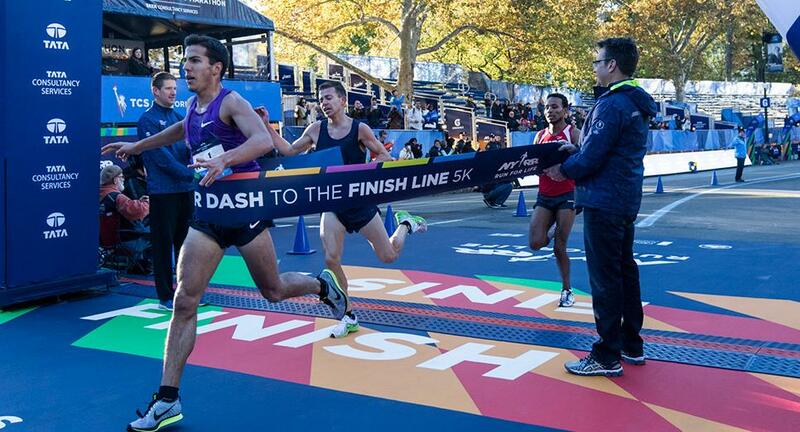 First across that finish line was defending champion and two-time Olympian Donn Cabral in 14:18. He was quickly followed by fellow Americans Scott Fauble in 14:21 and Kyle Merber in 14:30. On the women’s side, Norway’s Karoline Bjerkeli Grovdal, also a two-time Olympian, took the tape in 15:40, followed by Alexi Pappas in 15:54 and Stephanie Bruce (USA) in 16:06. While some participants in today’s 5K will also take on 26.2 miles Sunday; others appreciate the opportunity to be part of Marathon Week festivities while running a more manageable distance. David Grudzien, a 53-year-old from Atlanta, used the Dash as a shakeout run—as well as an opportunity to acclimate to NYC’s fall temperatures. “This is perfect. This is my running weather,” said Grudzien, who will take on his first New York City Marathon Sunday. Just like the marathon, the Dash draws a large international field, many runners donning their country’s colors and racing with flags painted on their faces. “But I’m the fastest! I won!” Situma’s youngest son chimed in. In addition to the UN, Tata Consultancy Services, title sponsor of the TCS New York City Marathon, also had a big representation in today’s race, with some 200 runners taking part in the 5K. Those who crossed the finish line at the Dash this morning are looking forward to cheering on their Team TCS colleagues racing the marathon tomorrow.